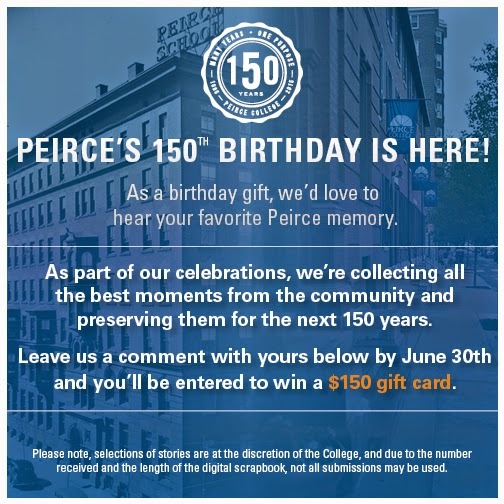 Become a Part of Peirce History with the Peirce 150 Memories Contest! The past 150 years have been filled with rich history at Peirce College and we’ve been fortunate to capture many of the stories along the way. However, the whole story wouldn’t be complete without the unique experiences of the individuals that make up Peirce College; our students, alumni, faculty and employees. That’s why starting today, we’re kicking off our 150 Peirce Memories Contest. Students, alumni, employees, and members of the Peirce community are invited to tell us their favorite memories from their time at the College. Everyone who submits a memory will have an equal chance to win a $150 gift card! We’re very excited that you are part of the Peirce community and we look forward to preserving your experiences! *Please note, selection of memories to be featured are at the discretion of the College and due to the number received and their length, not all memories received may be used.